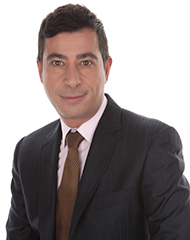 Constantine Nastos - Ballas, Pelecanos & Associates L.P.C. Born in 1970 in Athens, Greece, Constantine is a member of the Competition and the Agency & Distribution Practice Groups. Constantine studied law at the Athens University Law School and holds a DEA (Diplome d‘ Etudes Approfondies/Master’s degree) from Liege University, Belgium , in European Law (emphasis on Constitutional Law, Comparative Constitutional Law, European Transport, Agricultural policy, European History, Competition Law ). He has also attended seminars on Automotive Sales, Competition & Advertising. Constantine is a member of the Korinthos Bar Association since 1997 and entitled to argue cases before all Courts of Appeal and lower Courts. Constantine has worked as in-house counsel for Ford Motor Hellas SAIC, a subsidiary of Ford Motor Company and as in- house counsel for Volvo Car Hellas SA , a subsidiary of Volvo Car Corporation. At "Ballas, Pelecanos & Associates L.P.C. ", Constantine advises the firm’s clients on all aspects of Greek and EU competition law with emphasis on the automotive sector.